It's spring here in Arizona, which means every once in a while we get to see a bright spot of color. 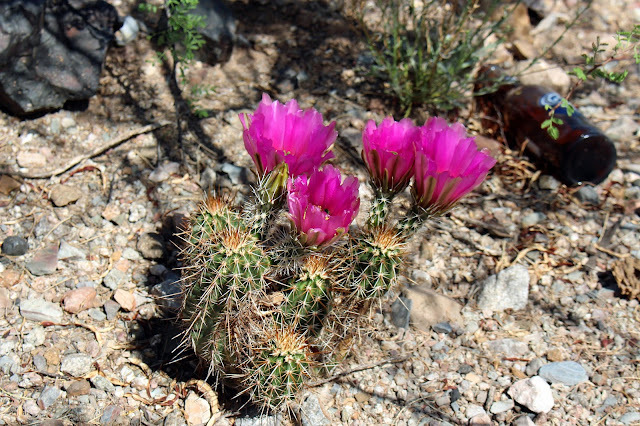 One of the most noticeable blooms along our route were those of the little hedgehog cactus. Against the muted tones of the sand and rocks they grow in, the vibrant fuchsia was hard to miss. I saw several jutting from the rocks and took a few shots myself, but Ed got this one somewhere along the trail he was on. Although he was in a remote area that's not traveled often, there's still that one idiot who leaves a beer bottle behind. Iron Eyes Cody would not be happy.